'In terms of new music, 2007 was less special, save for Magnus Lindberg's fine violin concerto, Heiner Goebbels's indefinably moving Songs from Wars I Have Seen, and Jonathan Harvey's adroit chamber opera Wagner Dream. There were no premieres worth mentioning at the Proms, save Esa-Pekka Salonen's Piano Concerto, quite the worst new piece to come my way all year' - writes Andrew Clements in today's Guardian. 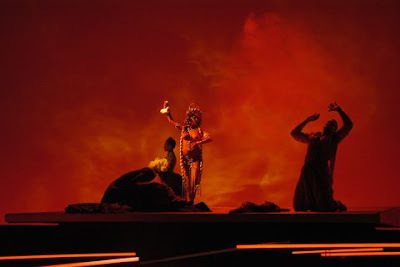 Read more about Jonathan Harvey's Wagner Dream in Malcolm Miller's review, which is where the production shot from the 2007 Holland Festival in Amsterdam came from. (Photo credit Clärchen and Matthias Baus). More on Jonathan Harvey here.